There is a key personal and business skill not formally taught today in schools. Yet it should be. Everyone needs training to improve their emotional intelligence. While there are no scholastic aptitude tests or board examinations for emotional intelligence, experts agree it is every bit as important as academic intelligence. Many would argue it is more important to achieving success in life. But this does not say that you cannot be taught to greatly increase your emotional intelligence; in fact, emotional intelligence can be taught. Emotional intelligence starts with knowing yourself. It then continues with knowing others. And a principle tool is learning how to classify people into groups with similar desires, skills, interests, and who behave similarly in given circumstances. Nathan Bryce developed such a tool with the Insight Temperament SystemTM. While there are other systems that classify people by temperament and behavior, Nathan invented a deceptively simple system that can be used as a part of everyday life. I have been using this system with great effect in my life. I’ve taught this system and my students’ remark on how it has improved theirs. Now I can extend this experience to you through our new book, Four People You Should Know: Profiting from Personality Perspectives. Four People You Should Know will introduce you to the Insight Temperament System and allow you to determine your own personality color. You will find resonance with the characteristics of your personality color group, and because we live in a social world, discover the other three personality colors. Learn how to listen to the people you meet and observe their behavior and surroundings, so that you can determine their personality color. With this, you can understand what they might do and why they do it. Priorities, motives and expectations fall in line. 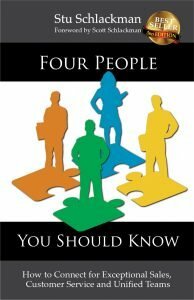 In “Four people” we explain the use of Nathan’s system to improve two key professional skills, team building and sales. You will learn how to balance teams and improve communications. You will understand what motivates your clients and how to effectively communicate what they truly value. One central thing we have learned, when it comes to building & leading great teams and being successful in selling, it all boils down to “relationships.” All relationships must start right and be properly nurtured. Understanding the four personality styles enhances existing relationships and helps build new relationships. Strong relationships will turn your clients into your advocates.